It’s been a banner few years for fast food fried chicken (Burger King’s chicken fries being the dreadful aberration). 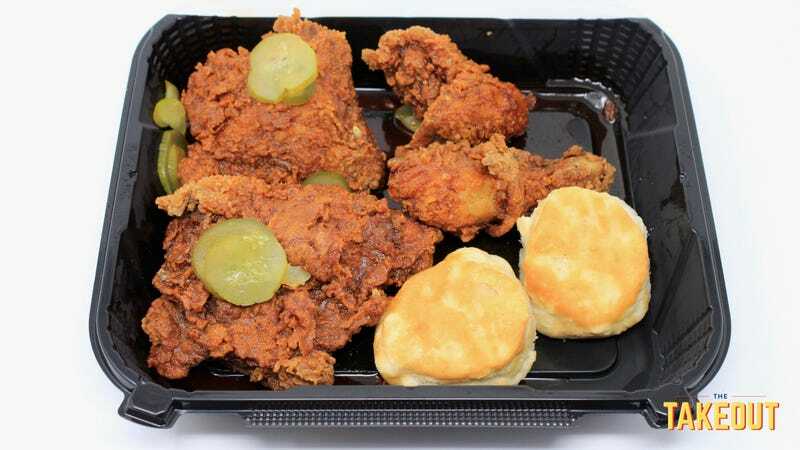 Raising Cane’s and its first-rate chicken fingers are expanding nationwide, ditto Jollibee and its Filipino “Chicken Joy.” Popeye’s Ghost Pepper wings are really tasty. And one could argue KFC kicked off the hot streak last year with Georgia Gold—Extra Crispy fried chicken tossed in a honey-mustard sauce, which I found bold and satisfying for a multi-national chain restaurant. 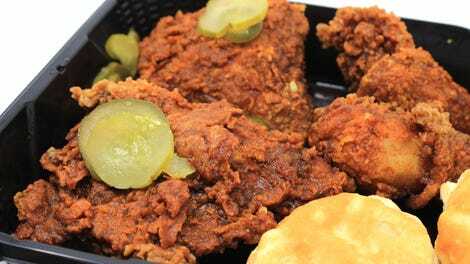 After Georgia Gold and Nashville Hot, KFC has continued its exploration of regional fried chicken with Smoky Mountain BBQ. Its marketing copy describes it as “the sweet, smoky flavors of Southern BBQ”—I suppose if we’re nitpicking the South is a vast region, most of it not very mountainous, and “Southern BBQ” is so generic and nonspecific the term is rendered meaningless. But we get the idea. It’s supposed to evoke a down-home feel, and the BBQ referenced is BBQ flavoring—you know, sweet and molasses-like KC Masterpiece. So why not just slather a bottle from the supermarket on your fried chicken? Standard BBQ bottled sauce is a thick glaze, and that textural interaction with double-breaded fried chicken would clash. So what KFC has engineered is an oil-based liquid featuring the flavor of BBQ sauce (think the consistency of Buffalo hot sauce + butter) that can serve as a tossing sauce for battered fried chicken. And that’s what we get with Smoky Mountain BBQ chicken: Fried chicken (in whole pieces, tenders, or hot wings) that retains its crispiness even after being sauced. That’s the key to it working. The heavy breading + slick sauce is texturally reminiscent of Hooters’ original wings—the exterior is too sturdy to go soggy. The barbecue sauce itself is generic if pleasing, more sweet-than-tang with good umami. What the flavor reminds me most is that savory-sweet dust in barbecue potato chips (specifically, Jay’s Open Pit BBQ chips). Smoky Mountain BBQ chicken doesn’t quite reach the heights of KFC Georgia Gold, but I can see the pedestrian nature of barbecue sauce having wider appeal. Kids would like this more than honey-mustard. (My updated KFC preference is thus: 1) Original Recipe. 2) Georgia Gold. 3) Coleslaw and mashed potatoes. 4) Smoky Mountain BBQ.) And so, huzzah, we continue to ride a solid fried chicken streak in 2018—now if only KFC brings back its Hot Wings to the permanent menu. Then America will truly be blessed.